A small paper on architectural styles for smartphone based AR was submitted to the 3rd International Standards Workshop for AR. Lots of great papers to digest here. Below is an extract showing the “Gateway” architectural style used by Layar, Junaio and Sekai Camera. My report on Augmented Reality for Smartphones is now open for comments here on the JISC Observatory blog. Some of the content has previously been previewed on this blog. Aimed at developers and content publishers who want to take advantage of the latest developments in smartphone and augmented reality (AR) technology, the report has an overview and comparison of different AR “browsers”, frameworks and publishing platforms. It also discusses emerging standards and usability issues and anti-patterns that developers should be aware of before designing an AR experience. And there is a section reviewing existing applications of AR in education that should inspire educators to give AR a bash. There is still a bit of time to incorporate some changes to the report so please do leave comments either here or on the JISC Observatory blog. If you are interested you might also be interested in the interactive session I’ll be giving on this at the Institutional Web Managers Workshop in July. 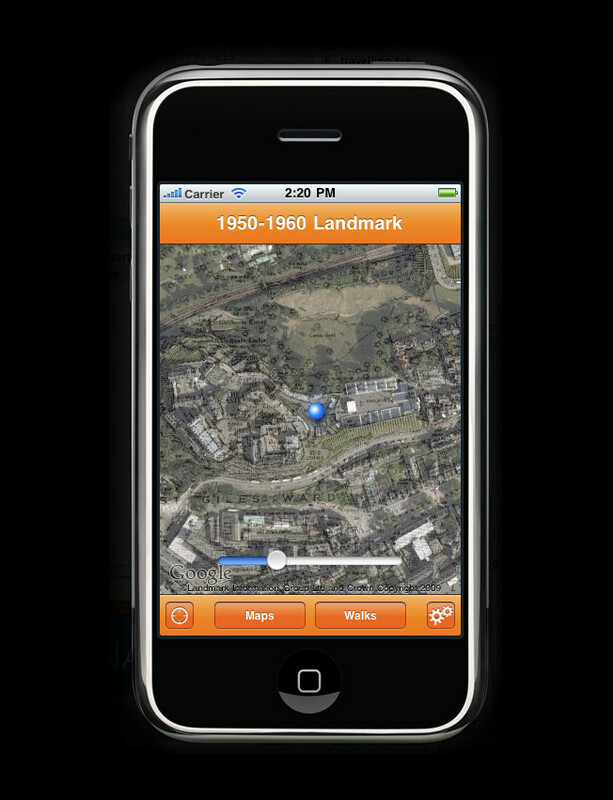 We think that a key feature for a mobile mapping application is the ability to view maps offline. One of our key use cases, a educational field trip exercise, requires access to maps in locations where network connectivity might be poor or non existant. Having access offline also widens the kinds of device we can use to include WiFi only devices such as the iPod Touch and no SIM iPad tablet. Threfore we’ve been working hard over the last couple of months on working out how we can cache maps. We’ve made alot of progress on this, developing the caching ability in the TouchMapLite library to be more robust and work with our WMS mapping server. This is possible in a web app environment thanks to 3 seperate HTML5 initiatives that assist web developers in caching data listed below. It’s quite easy to get these three flavours of caching mixed up (I’ve done so myself), so one of our engineers has blogged on the subject, explaining what each one does and offering some very helpful hints and gotchas. The first post focuses on the Application Cache, with similar posts on SQL database and Web Storage to follow shortly [update 22 feb 2011: Our engineer has now blogged part 2 ( web SQL database) and part 3 (Web Storage) – some very useful comparisons. We are going to share the techniques we’ve developed for caching maps during the upcoming OpenLayers Code Sprint in Lausanne later this month. It’s really great to see the OpenLayers development community tackling mobile in earnest this year. Respect to CampToCamp and other sponsers for organizing and sponsoring the event. Geomobile is looking forward to sharing progress with its readers! I’m currently researching capabilities of augmented reality browsers as part of a future JISC Observatory Report on Augmented Reality In Smartphones, aimed at helping developers and content publishers working in Higher Education exploit this technology to create novel and exciting new learning experiences. If all goes well this report will be in its final stages in the New Year. I’ve started off by developing a classification of augmented reality browsers that aims to assist developers and content publishers to navigate the confusing landscape of applications and frameworks that has emerged as augmented reality technology becomes increasingly ubiquitous. 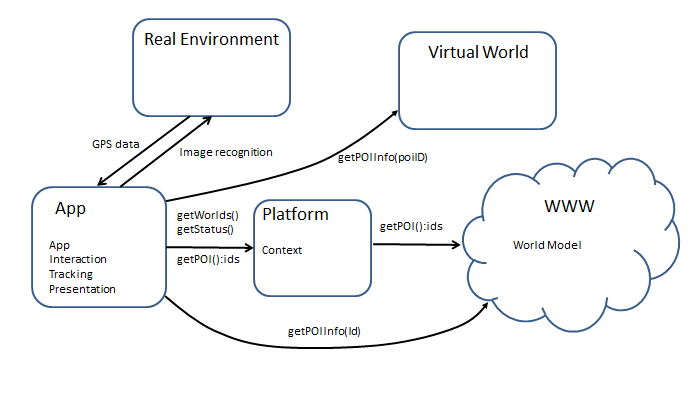 There are some existing taxonomies of augmented reality applications in general, such as Papagiannakis et al. , but as far as I know there is no existing classification of the browsers and application frameworks recently made available on smartphone devices. 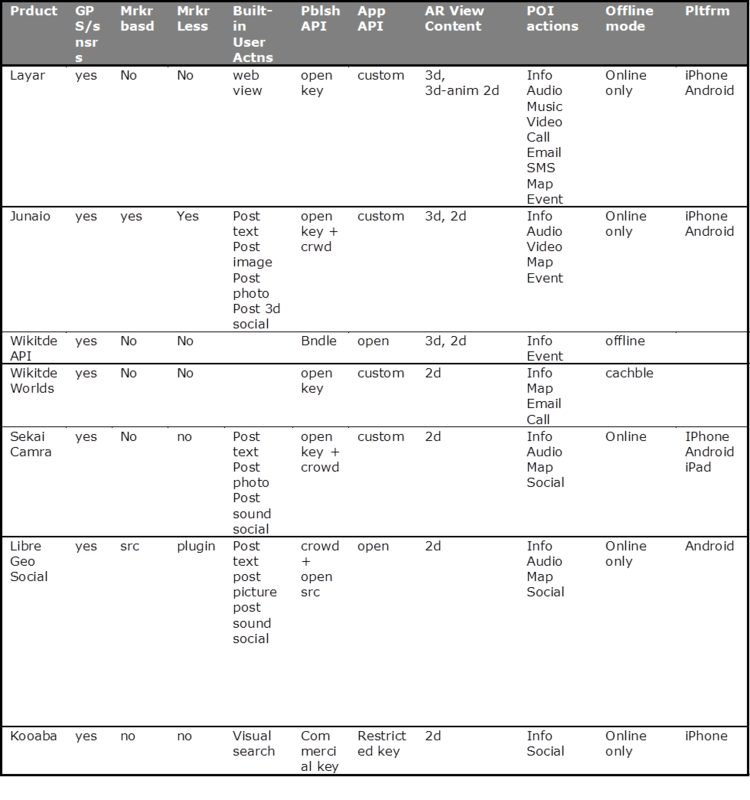 The table below shows the results of several days research trawling through documentation and experimenting with the browsers on our development phones (iPhone 3GS and Android Legend). A full explanation of the classification criteria I’m working with would take several blog posts, so you’ll have to wait for the JISC report, but below I give a very brief summary and report some early findings. it will be interesting to get feedback from members of the geo mobile community on whether the classification ( alway contentious) makes sense to them. Post text user can post a text message to the current location / orientation of the handset. Often users can choose a 2d icon or sometime a 3d icon to represent the message in the browser reality view. 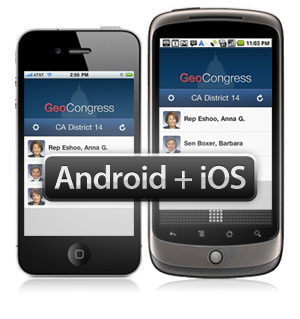 Post image user can choose an image already in the handset gallery to the current location /orientation of the handset. Post 3d user can select a 3d model and make it viewable to public or friends at the current location orientation of the handset. WebView the developer can offer arbitrary web based services to user through an embedded web viewer. Social the user has access to social network platform including common actions such as follow, invite, comment etc. Typically user generate content such as posting text messages can be configured so that only friends in the users social network can see the content. Crowd crowd sourced content is published by regular users using facilities available in the browser itself, Typically, images, audio clips and text as well as a predefined gallery of 3d objects are available for crowd sourced content publishing. Open [key] Platform provides an API that allows developers to publish their own data. For open keys there is no registration fee for developers and no practical limit on the users access to the published content. This also includes platforms that allow developers to publish their content without any key or registration at all. Commercial [key] A publishing API is available but some kind of fee or restriction on use is applied by the platform provider. Bundled data is bundled into the app itself. This assumes developer has access to the browser source code and can therefore create and publish their own apps for download. Open [key] A developer can reuse browser code and APIs to create their own version of the browser and are free to publish the application independently of the platform provider. Restr[icted] A developer can create their own version of the application but license restrictions apply to publishing the app. Com[mercial] a commercial license is required to develop applications using the framework/API. Custom[ize only] The developer cannot add any real functionality to the application but the visual appearance can be changed and optional functionality switched on or off. 3d a 3d object can be superimposed on the reality (camera) view in 3d space to give the impression that the object is part of the natural environment. 3d-anim[ated] a 3d object is superimposed on the reality (camera) view and parts of the model can be made to move using 3d animation techniques. Map/Take Me There see POI on as pin on map with option to show route from current location to POI location. Cached layer Channels or layers can be cached while online. It’s possible to view the criteria in the table from the perspective of the user ( I want to do cool stuff) and from the perspective of the developer ( I want more control over want user can see and do). To visualize this I scored the browsers against user and developer preferences, using a fairly arbitrary scoring system against the criteria discussed above and adding an extra “build quality” criteria to score the user axis and “developer tools” criteria to the developer axis to get the bubble chart below. 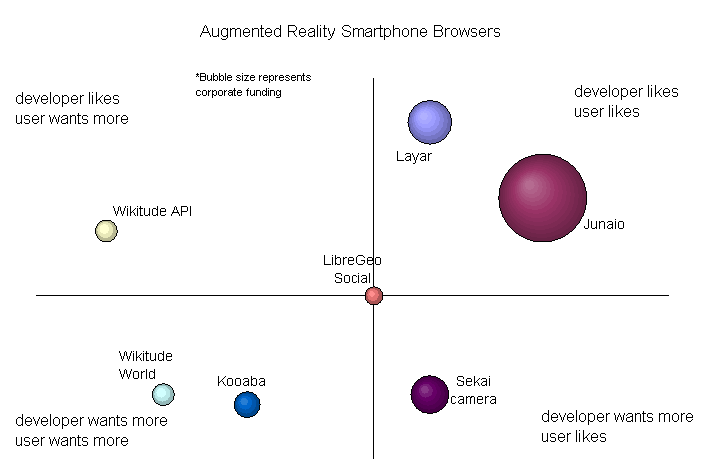 The size of the bubbles represent the corporate strength of the organisation behind the browser. As the AR browser game is a winner takes all land grab, having some strong venture capital or solid private investment is not an irrelevant consideration in choosing a tool that meets your needs. It goes without saying that charts such as that below need to be taken with a pinch of salt. It all really depends what your needs are as a developer or content publisher. SREngine: this looks like a promising framework for performing visual search but appears to be focused on the Japanese market for the moment. As a result we struggled to get enough English language documentation to fill in our classification matrix and also could not get the app from the UK AppStore. GeoVector World Surfer: World surfer provides an appealing browser that allows you to point the handset and discover POI. There is a reality view but this only works on a single POI the user has already selected. There does not appear to be any developer access to either publishing or application framework at this point. AcrossAir: Is an AR browser that is sold as a marketing tool to content providers. The vendor controls both publishing and application development so there is not much scope for developers to utilize this platform unless they have a marketing budget. RobotVision: One of the most impressive independent offerings. But there are no APIs for developers and the project seems to have stalled with no recent updates on the AppStore. A new web mapping service is now available that makes the Ordnance Survery Open datasets available through WMS. The service offered by EDINA is initially available to anyone with an “ac.uk” email and requires a simple email activated registration. Other than that, there are no restrictions on use. The website includes an example mapping app using OpenLayers and isntructions on how to use the service with Google Earth. We also created a mobile app using this datasource, as described in a previous post on the TouchMapLite interface. you can register for the service (initially ac.uk email addresses only) here. 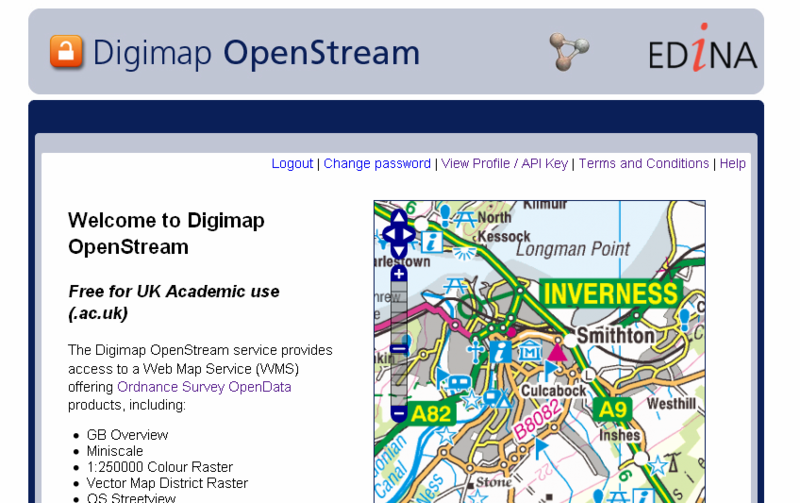 If you would like to find out how you can use Digimap OpenStream with desktop GIS you should read the Go-Geo! Blog. A new version of the “Walking Through Time” app that we’ve had some involvement in has just been launched as a free app on the App Store. 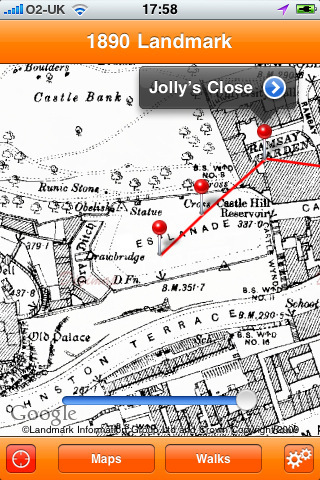 The app makes a range of historic maps sourced from Landmark and The National Library of Scotland available on your iPhone so you can see how the part of town you’re walking through looked in the past and has changed through time. A nice new feature is the opacity slider that lets you change the opacity of the comtemporary (Google arial) layer to reveal more or less of the historic map. Some historic tours have also been provided with help from Edinburgh World Heritage and Margaret Stewart. The app was developed as aprt of the JISC Rapid Innovation Programme with the Edinburgh College of Art, University Of Edinburgh and EDINA as proejct partners. The app only works for maps in Edinburgh at the moment. The final report for the Digimap Mobile Scoping Study is available. Comments greatly appreciated! Having looked at openlayers, we had problems with performance on mobile devices. A latency problem especially when dragging/panning the map. A new framework has recently appeared that addresses that issue called touchMapLite. Its very lightweight at (35k) and based on the pano.js library http://code.google.com/p/panojs/. Its in the early development stage but we were impressed with it. 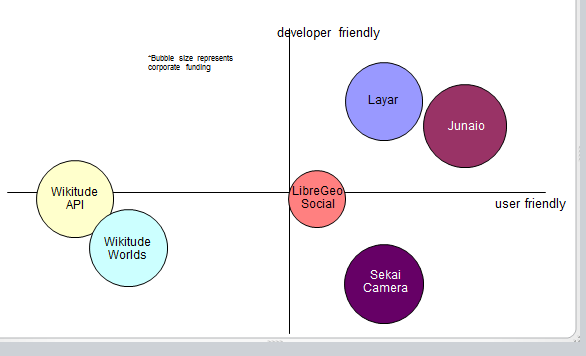 Of course you are losing a lot of potential functionally when compared with openlayers and it has great documentation. If you just care about rendering performance and maybe basic use of markers then this small library might be the way to go. There isn’t much in the way of documentation with touchMapLite although there are some helpful samples that come with the source. Another caveat is the type of map source you are displaying for example one source we are using is in British National Grid EPSG:27700 projection with units in meters. so x=0.5,y=0.5 would give you the centre of the map near equatorial guinea. So we had a quite bit of work to get one of our map sources to work with it. in openlayers you can simply this declare this at map construction time. Google,TMS and WMS,lat, long, Spherical Mercator projection it should work out the box. However the performance difference is noticeable between the two libs. touchMapLite gives a user experience closer to a native application. There is code in touchMapLite that uses some HTML5 storage features. HTML5 canvas is used to base64 requested images and store them in a client-side SQL database. This would be a nice feature for an off-line application for use when travelling to remote parts of the country for field trips, hillwalking etc. I suppose you could use a cache.manifest instead when you are sure of the locations of your tile images but this technique would lose the flexibility of the canvas/sql approach. 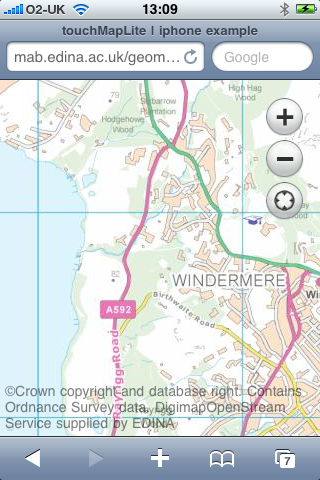 Here is our example of using touchMapLite using a WMS map source. 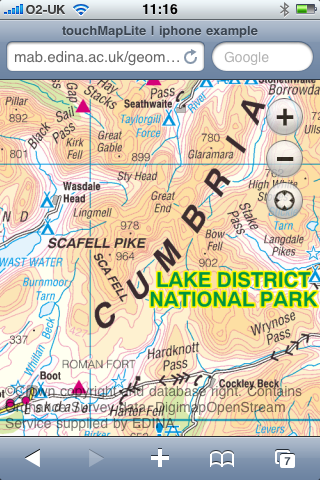 It uses the ordnance survey products stack which has been recently been made freely available. https://www.ordnancesurvey.co.uk/opendatadownload/products.html. We have used a local map-server installation to serve up the osopen stack. Android + iOS, or is should that be the other way round? The app seems to add the usual functionality but looks to standardise things such as icon libraries and proports to have found a way to determine screen size/resolution and dynamically adjust the app accordingly. All sounds quite promising. There are some example apps that use Sencha on the site but initial reports suggest that these are a bit flaky and unreliable. However, they are a positive step in the right direction in making cross-platform apps that look and feel native. Sencha is distributed under the GNU GPL license v3 which is good to hear. Lets keep an eye on Sencha and see what happens.